Perhaps you were like me Sunday night and you watched Discovery Channel’s SkyWire special. If not, well, I’ll fill you in: Nik Wallenda, a renowned tightrope walker and daredevil, walked across the Grand Canyon with no harness or catchnet. Every second was caught on film and it was intense. This whole event got me thinking about leadership and management. Nik embarked on an all-or-nothing adventure that would make or literally break him. Much of our daily lives are similar. We are forced to walk a tightrope, where consistency, balance, and pace are imperative to keeping us alive. Without a balanced tactic, we run the risk of sliding off of the narrow tightrope and failing. The stakes are high as a leader and person in the spotlight round the clock… but the rewards are also worthwhile and life is ultimately satisfying. The other thing to take from this is activity. 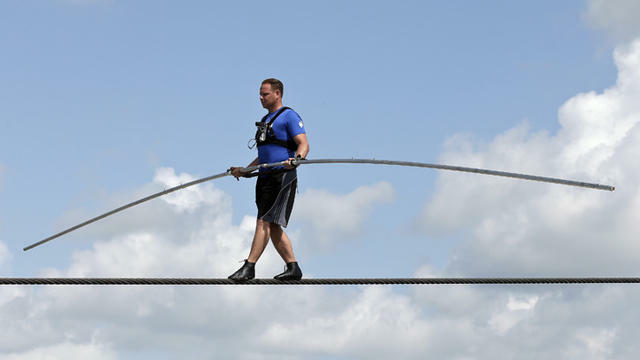 I’d never heard of Nik Wallenda before Sunday night. In order for us to be effective, we need to be in the game and leading alongside others. If we sit around on the couch eating Doritos and watching tv all day long, our amazing potential to affect others may never be realized.